Feb - 12 | By: Oregon Film | 3 comments. When Perry sent me an email letting me know that he had purchased a jet airliner mock up I knew I had to go check it out. 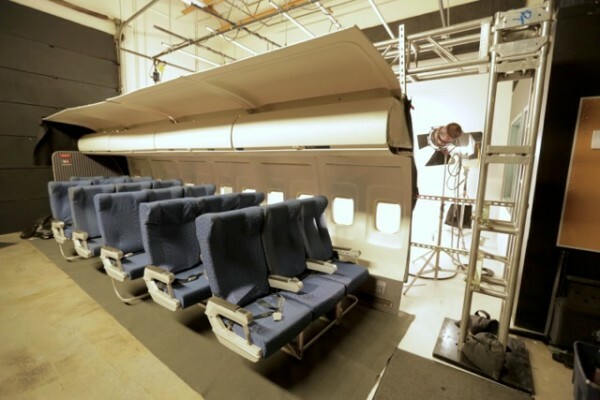 While one or two options for filming in an airliner exist, none present an option that is logistically straight forward and simple. Shooting inside a real plane is of course the most realistic but the process is complex. Everything, including all crew and equipment, must pass through security and the crew is matched up with TSA agents inside and outside on the tarmac. 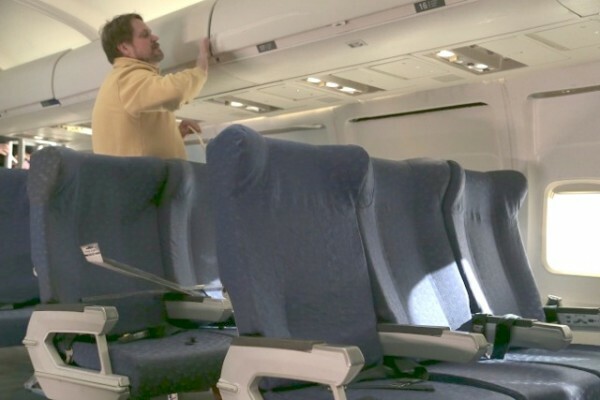 Extra tall stands are needed to get light through the windows and should you want to move a row of seating a flight mechanic is required to do the work, for an additional fee. Its also important to understand that airlines make money when planes are in the air, not on the ground. If they stay on the ground for you, you’ll need to pay for aircraft time as well. With this kind of a scenario in mind I was interested to see what the situation would be at the new Picture This Production Services option. What I found was 20+ feet of the starboard interior of a Boeing 737 fuselage. As the photos will bear out, the fuselage set includes, overhead ceiling, working luggage bins, passenger service units with working lights and spacers, window units, triple seating for 8 rows and double seating for 2 rows. There is also a Class divider which can be used to create first class seating complete with carpet and service trolleys. The mock up easily accommodates everything from a simple two panel, two row set for that shot of the talent looking out the window (wishing they were back in Portland), to a larger shot with 5 seats across and passenger service. 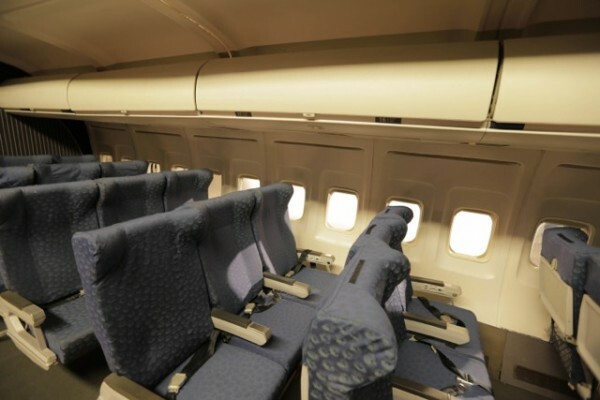 Since the mock up is all modular you can easily dolly down the aisle past rows of triple seating or add some rows across the aisle and dolly through port side seating as well for extra depth. Window effects, lighting for day or night time as well as different types of video walls are available. The full set goes up in about 4 hours with two hands. Book a session and all this is preassembled for you on a Picture This Production Services stage. What once was a logistical challenge now becomes just another day on the stage. I was intrigued by the fact that Picture This Production Services assembled the fuselage set from 3 different sources nationwide. Make no mistake about it though, it’s the real thing, it’s just that it’s now a breakaway set. Photos courtesy of Picture This Production Services. See more photos, videos and information at their Facebook page or just call them at 503-235-3456. Thanks for the awesome write-up! We’re very excited about our set! It was great seeing you, Bob. Hope to see you soon! this is great, so hard to find decent plane mock ups. congrats.